The Lodge at Mulbarton is a large listed Georgian house built circa 1800, situated just outside Norwich in Norfolk, with a swimming pool and a bungalow. The requirement was for an energy efficient system to provide heating and hot water to replace an oil-powered boiler system. The customer wanted the best possible solution for this complex installation to reduce cost and environmental impact, improve performance and resolve a condensation issue. There was also a requirement for a high level of user control to ensure all the parts of the system were operating as required via a user-friendly interface that would not be overly complex. Viessmann installation partner, Heat Different, was called to provide a ground source heat pump solution within a two-month time frame. Expert geologists were involved in assessing the site's suitability for a bore hole for a ground source heat pump and ensuring the existing well, which dates back to the 1800s, was sympathetically upgraded. Three Viessmann Vitocal 300-G heat pumps were then installed in a cascade with a master, slave, master configuration on an efficient open loop. Pipe runs and materials were calculated to reduce pressure drops. The system is supplied via a bore hole drilled to a depth of 60 m so that the source temperature is always high. The cascade consists of one master heat pump for hot water and heating, a slave pump to back up the heating and a second master for heating the swimming pool and for backing up the heating. The use of three pumps in this way brings down running costs as the pumps only operate when they are needed. This is more efficient than operating one large pump and the upfront cost was also lower. In total, there are six separately controlled heating zones. Not only does this individualised zone control ensure the system is used as efficiently as possible, five of the zones feature weather compensation controls for additional savings. In the main house and bungalow, a total of four PAW mixed pumping stations provide weather compensated control over three heating circuits, each of which is fitted with a Viessmann Vitotrol system controller. The pool temperature and air handling are also controlled by a Vitotrol app. Viessmann controls were used throughout, so every element of the system communicates directly with the heat pumps. The controls can also be operated remotely online. The house and bungalow heating zones use a mix of underfloor heating and radiators. 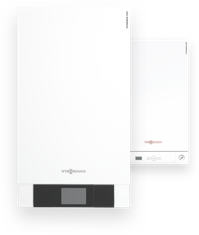 The plant room features a Viessmann water to brine plate heat exchanger which can be taken apart for maintenance, and a 500-litre hot water cylinder that is plate loaded for maximum efficiency. Its heat-up time is very quick due to the surface area of the plates being larger than a coil. There are an additional two 800-litre buffer cylinders which are loaded by high-efficiency Wilo-Stratos heat pumps. The plant room is connected to the house via Rehau underground insulated pipes which offer market-leading protection against heat loss. Everything about the system was designed to maximise efficiency. The customer received a full day of training on the system controls as well as a handover pack containing all the information needed to operate and maintain the system. The new heating system is expected to generate £2,221 per year in fuel cost savings. The customer was exceptionally pleased and said: "I have to say I am over the moon with the installation. Not only am I benefiting from a comfortable house and endless hot water, but the fuel savings alone make this project a success for me. My pool is warm and the condensation problem has been sorted. I am proud of this project and can't stop showing it off. From start to finish I found Heat Different a pleasure to work with. These guys are extremely talented at what they do. What they have achieved here is seriously impressive and the comments we have received about this project are very encouraging. I have no regrets whatsoever. Well done, guys."